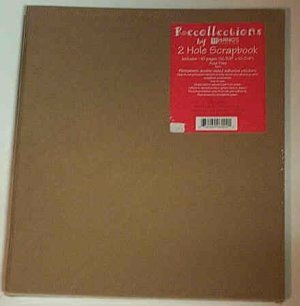 2 Hole Scrapbook- kraft paper; This is a 2 hole scrapbook with brown kraft paper covering. This scrapbook includes 10 pages (12 3/8" x 10 3/4"), acid free with permanent double sided adhesiv..
2 Hole Scrapbook- kraft paper; This is a 2 hole scrapbook with brown kraft paper covering. This scrapbook includes 10 pages (12 3/8" x 10 3/4"), acid free with permanent double sided adhesive stickers to help secure photos and other scrapbooking materials. This scrapbook is great for the beginner scrapbooker to the experienced. Because it has a kraft paper covering this is a great scrapbook for true personalization. Markers, crayons or paint can be used to draw and illustrate on this cover. This is also good for a child that would like to start learning how to do scrapbooking. They can draw their own pictures on the cover. (Buy the "Memories made easy" to go along with this scrapbook, many different types available).